Analyzing the case for selling stocks with exposure to industrial automation and the U.S. housing market. It's always interesting when analysts initiate coverage of stocks in a major sector. The ratings given are termed as overweight and underweight, but for practical purposes you can assume "buy" and "sell." Having already looked at some of the positive recommendations from Morgan Stanley, it's time to examine whether its two negative ratings, for Rockwell Automation (NYSE:ROK) and Lennox International (NYSE:LII), are worth selling. Rockwell Automation stock has had plenty of good news in 2018. For example, management started its fiscal 2018 predicting full-year organic sales growth of 3.5% to 6.5% and adjusted earnings per share of $7.20 to $7.50, but fast-forward to the recent third quarter, and organic sales are now expected to grow 5.5%, the high end of original guidance. Meanwhile, adjusted EPS guidance is now expected in the range of $7.90 to $8.10. Given the positive earnings momentum, why are some analysts, including Morgan Stanley, negative on the stock? One of the possible reasons is the argument that its premium rating is no longer justified, given fears about a cyclical slowing in some of its end markets -- most notably the automotive industry. Let's take a closer look at these arguments. 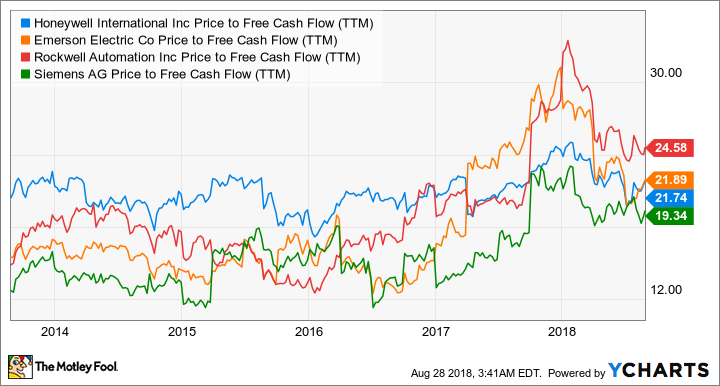 Starting with the valuation issue, on a price-to-free cash flow basis, Rockwell currently trades at a premium to some of its peers. 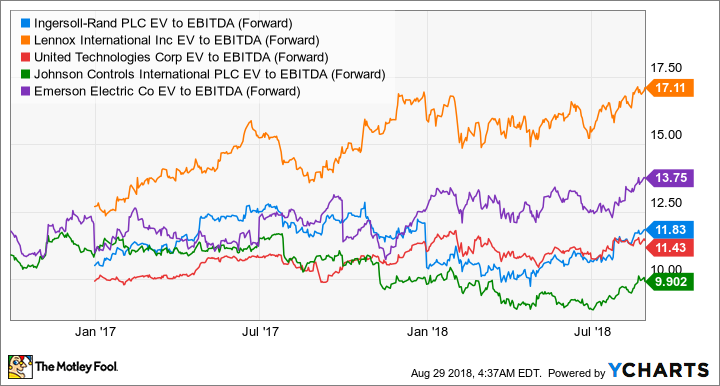 However, analysts are right to question Rockwell's relative valuation, because peer Emerson Electric (NYSE:EMR) has outgrown Rockwell in the past three quarters. The difference is that Emerson is more of a process automation company and has more exposure to capital spending of energy and heavy industry-related companies, which are growing faster than Rockwell's end markets. The latter is more of a factory automation company and has more general industrial exposure, notably to the automotive industry. "Given the short-term visibility of this business, from today's perspective, we expect also a positive trend in the fourth quarter to come. However, growth rates will ease, particularly in China, into fiscal '19 due to tougher comps and moderation of the extraordinary business dynamics." In addition, Siemens and Rockwell are both seeing deterioration in the key automotive end markets in the United States. Rockwell's automotive market sales were down 10% in its recent third quarter, while Thomas talked of a "moderating" environment in the United States. That said, I don't think it's time to be overly negative on Rockwell. There are four key arguments. First, while automotive is slowing, Rockwell cited strength in other areas, including semiconductors, metals, and food and beverage. Moreover, Siemens' Thomas also referred to "nice momentum in other industries like food and beverage" and talked of a bounce back in "commodity industries." Second, it's important to note that we're talking about a moderation in growth rather than a decline. Analysts have Rockwell's reported sales growth slowing to 5.1% in 2019 from 6.2% in 2018, but it's not as if sales are about to fall off a cliff. Third, if Rockwell hits analyst EPS consensus in 2019 and converts net income into FCF at 100% -- a conservative assumption, given its FCF conversion history -- then the stock will trade at less than 19 times 2019 FCF. That's an attractive valuation for a stock with long-term secular growth prospects in the Internet of Things. Fourth, Emerson Electric's failed bid of $225 a share -- a 27% premium to current price of $177 -- highlights the attractiveness of the stock for potential bidders. All told, Rockwell's stock isn't cheap, but it's also not expensive. And if it can hit earnings forecasts, then the stock is worth holding, in my opinion. The situation is rather simpler with heating, ventilation, and air conditioning company (HVAC) Lennox International. HVAC is undoubtedly an attractive market to be positioned in. However, it's hard to make the case that Lennox is the best buy in the sector. It's expensive on a relative basis, based on the EV-to-EBITDA ratio. Moreover, Lennox generates 93% of its revenue from North America and the remaining 7% from Europe. In other words, it's not a play on emerging-market growth. So why do investors buy Lennox International stock? Lennox is interesting for investors because of its heavy exposure to the U.S. residential market, which makes up 59% of total sales. In other words, it's a play on the U.S. housing market. It's also a good end market. as employment gains and rising incomes usually provide good support to the U.S. housing market. In addition, Lennox generates nearly three quarters of its sales through the replacement market, meaning it should have a stable source of recurring revenue in any downturn. That said, Lennox's valuation is also looking expensive on an absolute basis. 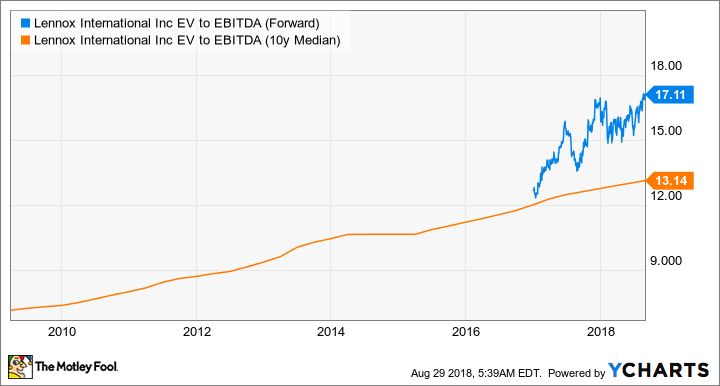 The following chart shows its forward EV-to-EBITDA ratio compared with the average of the past decade. Which one's the better pick? It's not hard to see why Morgan Stanley might be negative on both stocks, but in Rockwell Automation's case, it's too early to conclude that investors should be exiting a company with good long-term prospects just because some of its end markets are slowing in 2019. On the other hand, Lennox International looks richly valued on a relative and absolute basis, and there are probably better ways to get exposure to the U.S. housing market than buying the stock.